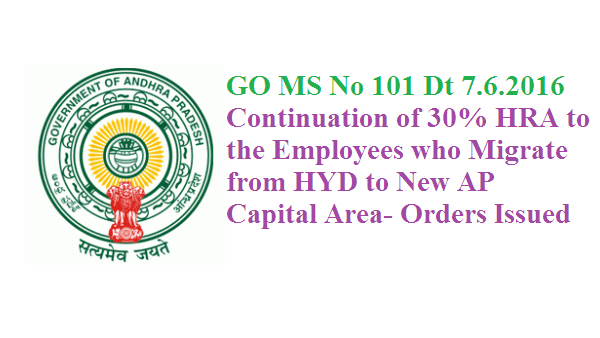 GO MS No 101 30% HRA to the Employees who Migrate form Hyd to New AP Capital Revised Pay Scales 2015 – House Rent Allowance (HRA) – Continuation of the existing rate of 30% H.R.A. to the employees of Secretariat and HOD, who migrate from Hyderabad to New Capital City, Amaravathi for a period of one year - Orders – Issued. In the G.O. 2nd cited, orders were issued for allowing House Rent Allowance @ 30% of Basic Pay subject to a maximum of Rs.20,000/- to the employees working in the offices situated in Hyderabad and Secunderabad which fall within the jurisdiction of Greater Hyderabad Municipal Corporation. In the reference 3rd cited, the association has brought to the notice of the Government that as per the existing pattern the House Rent Allowance is being paid to the employees of Secretariat and heads of Departments in Hyderabad @ 30% and requested to issue orders for continuation of the existing rate of 30% H.R.A., to the employees who migrate from Hyderabad city to the new capital city of Amaravati or at the place proposed shifting of Secretariat / HoD Administration temporarily. Government after careful examination of the matter is hereby order that the employees of Secretariat and Heads of Departments and other offices who migrate from Hyderabad on shifting the Government Offices to New Capital City of Amaravathi shall continue to draw the existing rate of House Rent Allowance @ 30% of Basic Pay subject to a maximum of Rs.20,000/- for a period of one year. These orders do not apply to CRDA staff and other local staff working in the Amaravati region.